In most of Europe, the state pays for a university education, meaning that university finances are both regressive and cyclical. This column asks how the alternative system of income-contingent university loans would fare in Spain. The analysis suggests that the policy is feasible even in a country with a relatively poorly functioning labour market for young graduates. “Universal compulsory school attendance. Free instruction. The former exists even in Germany, the second in Switzerland and in the United States in the case of elementary schools. If in some states of the latter country higher education institutions are also ‘free’, that only means in fact defraying the cost of education of the upper classes from the general tax receipts.” These are the words of Karl Marx in his notes to the Gotha Program in 1875. Nowadays, in most of Europe, the state pays for a university education. Since the beneficiaries are to a disproportionate extent the children of better off families, this means that university finances are quite regressive. Beyond its lack of progressivity, another big problem of a mostly publicly funded higher education is that university finances can be quite cyclical. In many places, the budget problems during the Great Recession meant that university finances were severely cut, and have not recovered. As the OECD’s Education at a Glance 2017 report said, “[a]lthough public funding for tertiary education increased in most countries, some are still behind their 2008 peak. This is the case for example for Canada, the­ Czech­ Republic, Hungary, Ireland, Italy, Portugal, the Russian Federation, Slovenia, Spain and the­ United­ States, where in 2014 public expenditure was lower than in 2008” (OECD 2017). Since in most of those countries public funding represents a very large part of total funding for higher education, universities are heavily impacted by cyclical shocks affecting public finances. In our recent article (Cabrales et al. 2018), we propose an alternative that prevents universities from being hostages of political cycles. It is basically an income-contingent university loan system. The idea is simple: graduates pay for their education, if they can. The state limits itself to providing an insurance mechanism in case the labour market outcomes of the graduates are not sufficiently positive. We focus on its application to Spain because the country’s labour market shows particularly bad behaviour(Bentolila et al. 2011), so if a loan system ‘works’ in Spain, it should work even better in other places in Europe. This system is not an invention of ours, nor is it particularly novel. It is currently used in the UK, Australia, and New Zealand to finance universities. It consists of an increase in university fees while at the same time offering income-contingent loans. There is a minimum income threshold, and if the ‘debtors’ do not receive an income above this threshold they do not have to pay back any of the loan – in the UK this threshold is £21,000. 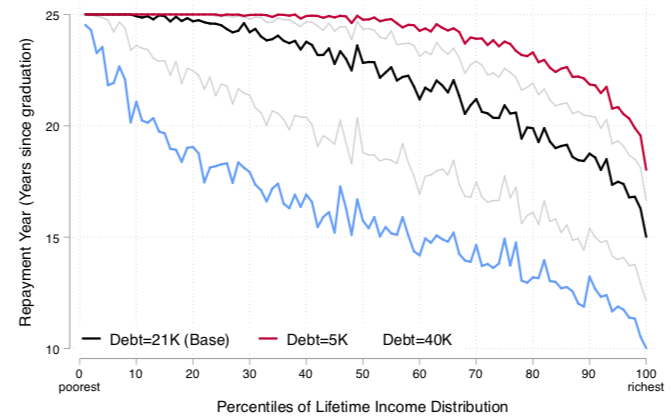 The interest rate can be low if that is the policy choice (although a higher interest rate is a key element of progressivity), and the payment is a percentage of the individual's income. If, after a period of time, the borrower has not returned the money, the loan is cancelled. The objective of this system is, on the one hand, to share the costs of education between beneficiaries and the government. It is true that education has externalities, but no estimate that we know suggests that these externalities are comparable to the 80% that the public sector currently pays in Spain. But risks are also shared. If the education provided is of poor quality, and the return is low, the cost is borne by the public sector. This, in turn, suggests that the public sector will have a greater incentive to monitor the quality of education under the system, since it bears more of the cost of bad outcomes. An important benefit of the system is that it allows university funding to be increased and separated from the economic cycle (as in fact has happened in the UK). And it also increases the progressivity of financing. To study the system, we created a virtual ‘laboratory’ that allows us to analyse the impact of different parameters of the model and its effects throughout the working life of individuals. We follow the methodology of Dearden et al. (2008), but since Spain’s labour market is so different, we adapt their methodology to the peculiarities of that market. We take special care to model transitions in and out of employment, labour market dynamics, and its high duality in Spain. For example, we take into account the fact that many flows towards a first job, and from unemployment, are towards temporary contracts. We use data from the Continuous Sample of Working Lives (Muestra Continua de Vida Laboral, or MCVL), which adequately represent the individual transitions between employment, non-employment, unemployment, and contract types. The MCVL also contains a link to income data via Spain’s income tax (Impuesto sobre la Renta de Personas Física, or IRPF). This allows us to simulate the transitions between states of employment as a function of income, age, and duration in the state. 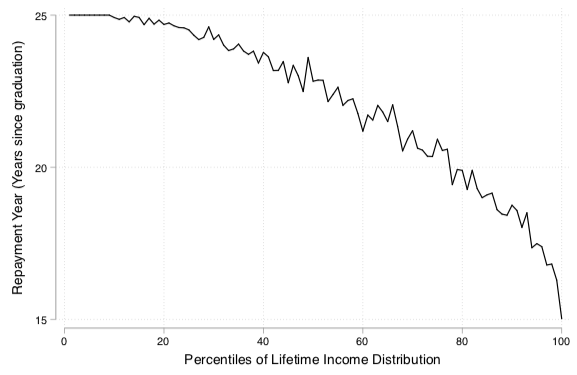 Income, within a state, is random (autoregressive) and depends on age. If there is a change of employment status, the new income is also random and depends on the age, duration of the previous state, and income. 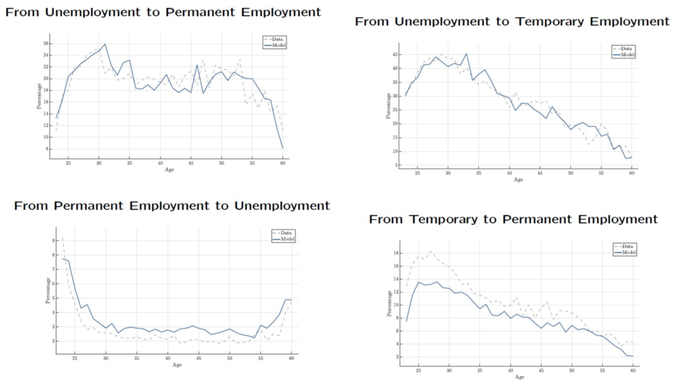 Figure 1 shows that the model dynamics fit the real transitions between employment states very well. The solid lines represent the results of the model, and the discontinuous lines represent the data. In a baseline scenario we examine (i) a debt of €21,000 (close to the current cost to the government), (ii) an interest rate of 0%, (iii) a loan repayment rate of 10% of the income per year above the threshold of €15,000, and (iv) cancellation of the debt after 25 years. In Figure 2 one can see how the system affects different individuals. 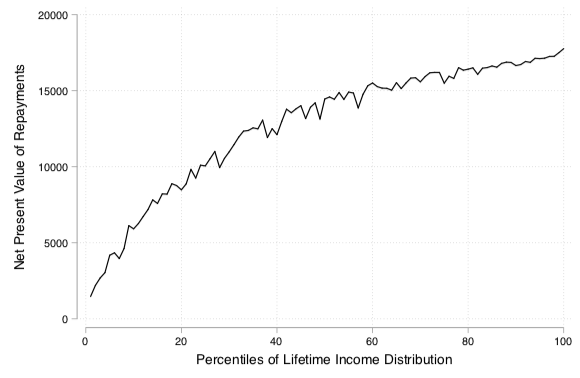 On the horizontal axis different people are represented by their position in the distribution of income throughout life. In the top panel, we show the discounted present value of what the individual pays. Logically, those who earn less pay practically nothing, and those who earn more pay up to €15,000. Why do even those who are not the richest pay everything? Because at a zero interest rate, the state does not recover everything that it lent in present value. The middle panel represents the years that individuals take to repay the loan. Here the poorest take longer to return, and the rich return earlier. 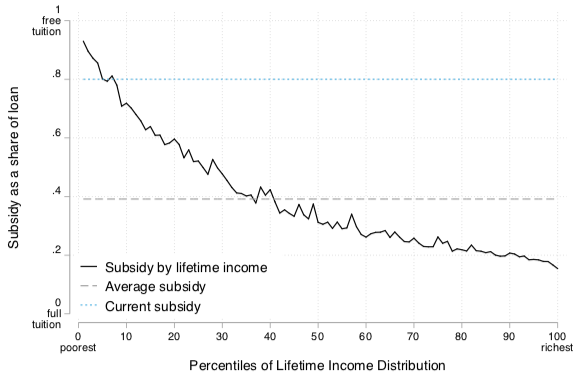 The bottom panel represents the implicit subsidy. 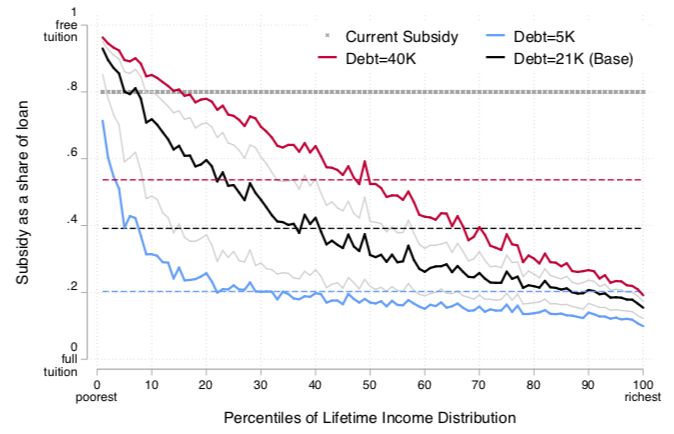 Again, clearly the subsidy is lower for the richest, but it is not zero, for the same reason that the discounted value of what is returned does not correspond to the loan. Then one can examine the impact of many variations on the base scenario – for example, the level of debt. This is important because we may want to improve the quality of the university system with higher fees, or facilitate regional mobility (note that in Sweden there are no fees but there are loans to finance living outside the parental home, which many students use). The results of these simulations can be seen in Figure 3. Another interesting variable is the interest rate. Although 0% is the most popular type, it is also the most regressive as was clearly seen in the graph of the base scenario. In our laboratory, increasing the interest rate transfers a greater part of the total cost to students who, after graduating, end up earning more. One can also examine the minimum threshold level, the percentage of income the debtors return, or the years for loan cancellation. 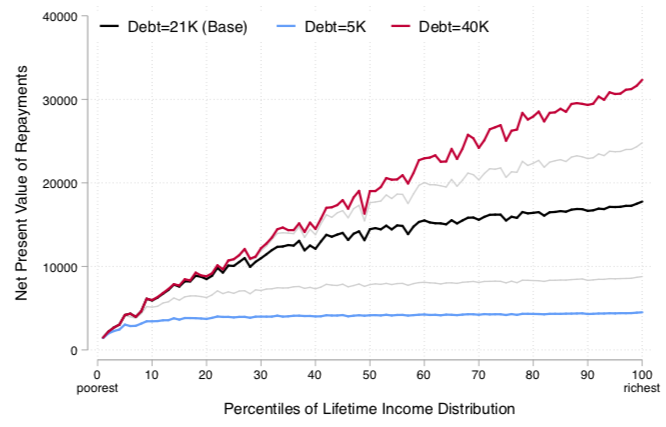 The structure we propose is highly progressive in all specifications (those in the top 25% of the income distribution pay back almost all of the loan, while those in the lowest 10% barely pay back anything). The amount of the university cost paid by the government is between 16 and 56 percentage points lower than in the current system. To conclude, a poorly functioning labour market for young university graduates could represent a challenge for an income-contingent loan system. In this sense, it is worth wondering if this system could work in a country like Spain. Contrary to what one may think, our analysis shows that this policy is feasible even there. The government will improve its fiscal position, and the beneficiaries pay for it at different levels. For the government, the extra resources can be spent by the government on other things – for example, on early childhood education (where the externality is greater and better documented), a more redistributive social expenditure, or lower taxes. For the individual, the minimum threshold and a maximum number of years to pay are a reasonable level of insurance for the possibility of not having sufficient income (this seems to us an improvement on the American system). And if one is concerned about the impact on young people from disadvantaged backgrounds, Azmat and Simion (2018) show that the equivalent reform in the UK has not meant that fewer people, particularly in low-income families, go to university. Azmat, G, and S Simion (2018). "Higher education funding reforms: a comprehensive analysis of educational and labor market outcomes in England," mimeo, Sciences Po, Paris. Cabrales, A, M Güell, R Madera, and A Viola (2018), “Income contingent university loans: policy design and an application to Spain,” Fedea Policy Papers-2018/06. Dearden, L, E Fitzsimons, A Goodman and G Kaplan (2008). "Higher education funding reforms in England: The distributional effects and the shifting balance of costs", The Economic Journal 118(526). OECD (2017), Education at a Glance 2017: OECD Indicators, Paris.